The singer, who hails from St Albans in Hertfordshire but now lives in Inverness, Scotland, has performed at stadiums around the world. 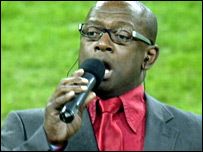 He was once known as the Voice of Arsenal after Gunners fans were impressed with his rendition of Abide with Me before the FA Cup final in 2003 at the Millennium Stadium in Cardiff. Henry came unstuck when he sang Lijepa Nasa Domovino (Our Beautiful Homeland) at a rain-swept Wembley on Wednesday night. "I can't even defend myself at the end of the day. It was apparently the last line on the second verse which I made the mistake on," he told BBC Radio 5 Live. "Coming to Wembley and the stadium, it must have got to me, is all I can say. "It was the last thing that I would intentionally do, and all I can say is if I have offended any Croatians, then they have my deepest apologies." On the contrary, Henry is becoming a cult hero in Croatia, but denies he played a part in England's exit. "I can't take the blame for that. The last thing I would do is brag about my parts like that - especially to make it so public," said Henry. BBC TV presenter Adrian Chiles, whose mother is Croatian, acknowledged the language could pose problems. "As a speaker of poor Croatian, I have a proud record of getting things calamitously wrong," said the Match of the Day 2 host. "My personal best was telling a campsite owner that I had a small rat (mali stakor) rather than small tent (mali shator). However, Tony's put all my lifetime's efforts into the shade now." Zeljka Tomljenovic, secretary of the British-Croatian Society, added: "I don't envy the guy at all because the pronunciation is so difficult. "He had a big challenge, to sing the national anthem in a language he knows, I assume, nothing about." Henry's agent Douglas Gillespie said it was a genuine mistake, but admitted the publicity could boost his career. "He's been given the lyrics correctly, but he has enough trouble with English, never mind Croatian," joked Gillespie. "There were 80,000 people in the crowd and millions of people watching. It was just the pressure of the moment. "He did sing it very well and made a very, very small mistake for someone doing his best and singing in a language that is alien to him. If you've ever tried to speak Croatian, it's very difficult. "The Croatians think it's great, and they've invited him to come over and sing at Euro 2008, and asked if he will be their mascot."